Perhaps the most versatile piece of camping gear you can buy is the tarp. Set it up as a sunshade, use it as a makeshift shelter, prop it up as a rain tarp, or use it as a ground cloth under your tent – your camp-craft options are truly limitless with a good tarp. However, these days, tarps come in so many shapes and sizes, it can be very difficult to choose just one to accompany you on your adventures. To help you out, we’ve researched and reviewed the best tarps on the market and created this buying guide, so you can get the tarp that’s right for you. We’ve even selected a top pick and a value pick to aid your decision. 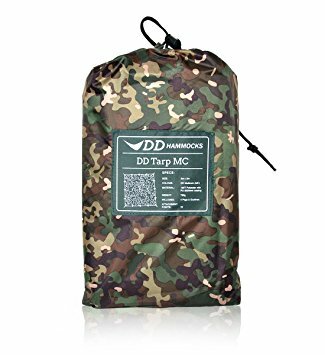 We chose the DD Hammocks Tarp as the top pick because it’s super versatile and includes a great set of useful accessories. The Wanderer 12’ x 20’ tarp was our value pick for its classic and simple design. Size: Tarps come in a variety of different shapes and sizes, so you’ll want to choose one that’s big enough to meet your needs. Big families looking to use their tarp as a rain cover or sunshade will want a larger tarp while solo campers and couples can get away with a smaller option. If you’re using your tarp as a ground cloth, we recommend measuring your tent’s footprint before you buy. Material: Some tarps are made with super durable materials so that they’re long-lasting workhorses while others are made to be light and compact for longer backpacking trips. If you’re looking to get a lot of mileage out of your tarp, you might opt for a heavy-duty option while weight and space-conscious campers will prefer a sleeker alternative. Accessories: Many tarps come packaged with an assortment of useful accessories, like tent pegs and guy lines to make set-up a breeze. Others are a bit more bare-bones and don’t even come with a stuff sack or carry case. If these little extras are important to you, they’re worth considering before you purchase your next tarp. Price: As always, the price is a consideration. Some campers might be willing to spend that little bit extra for a specific feature while others just need something that’ll get the job done. We’ve selected a wide range of tarps for this review that’ll satisfy any budget. DD Hammocks really stepped their game up with this tarp. With nineteen (yes, you read that right) different reinforced attachment points, there’s nothing this tarp can’t do. Whether you pitch it as your shelter for the night, use it as a rain cover in a deluge, or turn it into a sunshade on a scorching day, you’re sure to be impressed by the innumerable options this tarp affords you. DD Hammocks makes this tarp out of burly 190T polyester and is finished with a PU 3000mm waterproof coating, so you can rest assured that you’re getting the best of the best here. The taped central seam and waterproof coating on this tarp mean you’ll stay dry in the wettest of storms. The tarp even comes with four pegs, guy lines, and a draw-cord stuff sack, so it’s ready to adventure right from the get-go. The top pick in our review, this tarp from DD won’t disappoint. Perfect for solo campers, couples, and small families, this is a burly tarp with an intelligent design that won’t let you down when you need it. 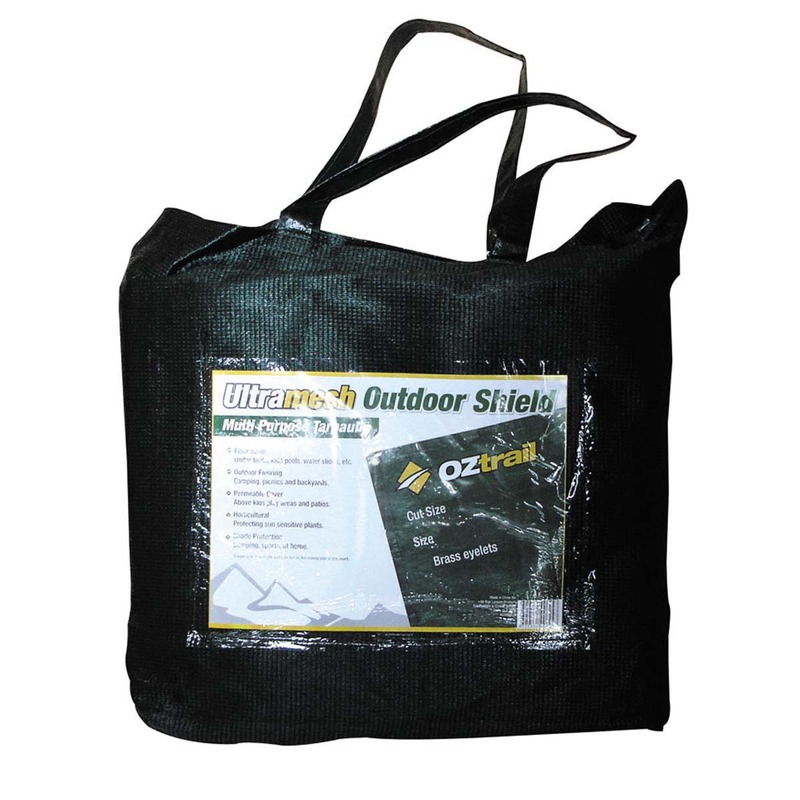 The OZtrail Ultramesh Shadecloth is the ultimate ground cloth for your tent or sunshade on a blistering day. Made from heavyweight UV stable shade cloth, this tarp blocks out 95% of the sun’s rays to keep you cool and sunburn-free on the hottest of days. Reinforced edging and brass eyelets mean that this is one tarp that’ll take anything you can throw at it. The Ultramesh Shadecloth boasts super easy set-up and a large surface area, so the whole family will appreciate being able to relax in its shadow. Also perfect for use as a ground cloth while pitching your tent, the Ultramesh Shadecloth will protect your tent floor and preserve the underlying grass at the same time. 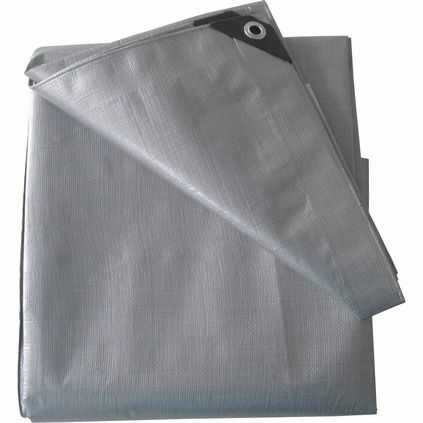 The tarp comes with a mesh carry bag for convenient transport and storage. This is a great buy for families and large groups in need of a durable, yet versatile tarp for camping. When you’re out camping, and the sky opens up to release an intense hail storm, you need a tarp that just won’t fail. The Boab Premium Heavy Duty Tarp is built specifically for durability in the harshest conditions. Designed with a heavy-duty 160gsm weave and with a rugged woven polyethylene laminated fabric on top and bottom, this tarp from Boab will keep you happy and protected from the elements. If that wasn’t enough, the extra corner reinforcements and twin needle stitching give the tarp added strength where it needs it most. The plethora of aluminium eyelets makes setting up this tarp easy as can be. The Boab’s large size means it’s great for families and groups. So what are you waiting for? 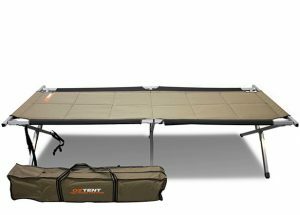 The Boab Premium Heavy Duty Tarp is calling your name! The Wanderer Medium Duty Tarp is this review’s value pick. Built with a time-tested, classic design, the Wanderer has all the features you expect from your tarp without any of the unwanted extras, all at an affordable price. 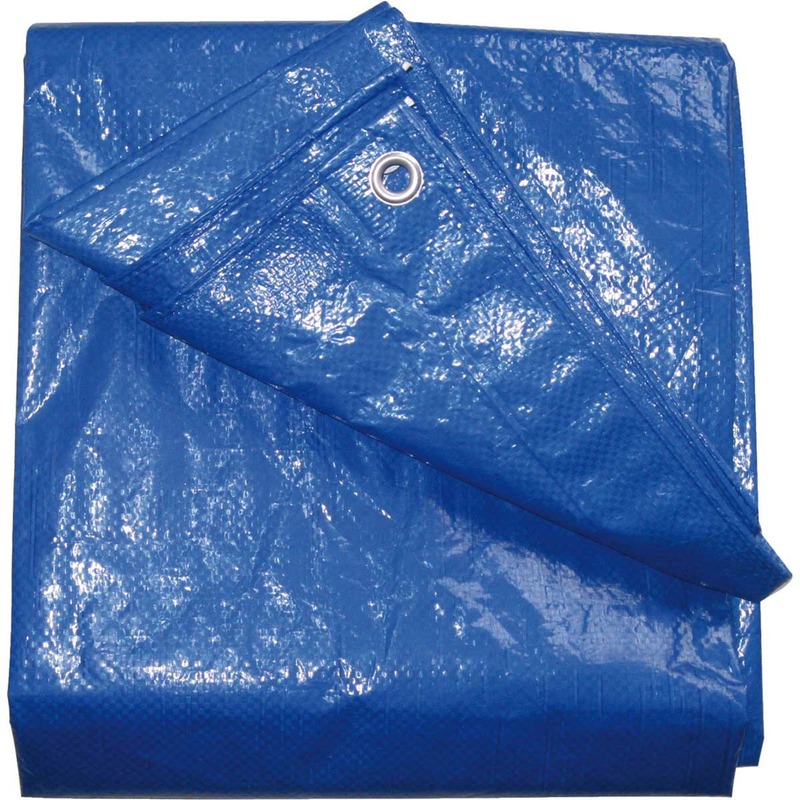 Made from a strong 105gsm woven polyethylene and a double-layer reinforced edge construction, you can be confident in this tarp’s ability to keep you dry or out of the sun. The heavy-duty eyelets are easy to use and are well-placed along the edges, so pitching options are really limitless with this tarp. The Wanderer keeps things simple, so you can get it pitched quickly when it matters most. 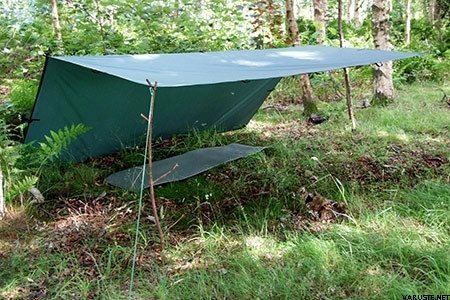 If you need a reliable tarp at a value price, you just can’t go wrong with this great tarp from Wanderer.